Growing: Â Easy to moderate The triumphant outcome of a rigorous selection and meticulous back crossing from the genes of Jack Herer, is the award winning Jack Flash. 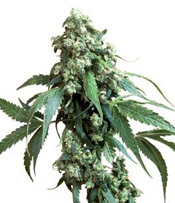 Coming from the lineage of one of the best cannabis in the world, this marijuana strain is an astounding balanced sativa and indica plant with its unparalleled mind-body potency and high yield. Sensi Seeds has once again achieved a milestone in creating a delicious, mild cerebral, tropical strain that is easy to grow and greatly performs in indoor growing method. Jack Flash can have an indica stature that is compact enough for Sea of Green with fast bud development that grows to outrageous sizes. Â One of its distinctive characteristics is its ability to produce multi point crowns on terminal buds. It is best suited in warmer climates with long summer season. The average flowering period is 60 to 70 days and it can produce massive yields especially if given extra care to achieve its full potential. Jack Flash has the perfect contrasting blend of indica and sativa strains. I am really glad I ordered the seeds from Sensi. It is a perfect addition to my garden.